A team representing the University of Helsinki and the CSTT has participated in what the excavation team believes to be the final season of digging at the Horvat Kur synagogue. 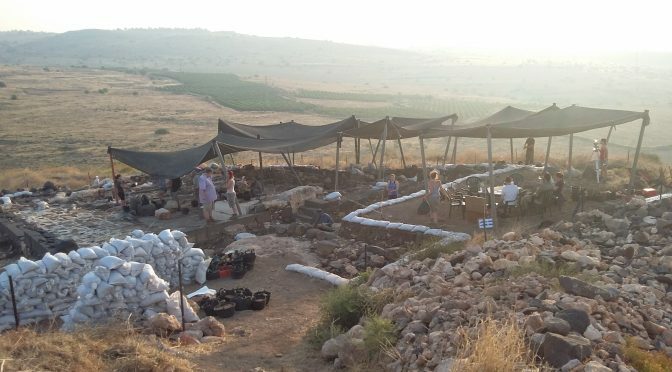 The Kinneret Regional Project, a joint expedition of the University of Helsinki, Leiden University, Bern University and Florida Atlantic University, finished the excavations of the Byzantine-era synagogue that was first found in 2010. During this year’s excavations, led by Jürgen Zangenberg, Raimo Hakola, Stefan Münger and Byron McCane, the team tried to find traces of the earliest phase of the building, which was apparently constructed for the first time in the second half of the fourth century. Earlier excavation seasons have revealed the detailed layout of a so-called broadhouse synagogue that was built at the site around 450 CE and later renovated at least once in the late sixth or early seventh century, before it went out of use in the seventh century. The team thought to be finishing the excavations of this synagogue already in 2015, when a mosaic floor predating the excavated synagogue was found. The mosaic contained a menorah, seven branched candle holder and the name of a synagogue benefactor (for an earlier report on the excavation of this mosaic, click here). The finding of the mosaic came as a surprise, because it soon became clear that the mosaic did not belong to the excavated broadhouse synagogue, but was from an unknown building predating it. During subsequent excavations, our team has tried to find more traces of this early building in order to understand better its layout and function. 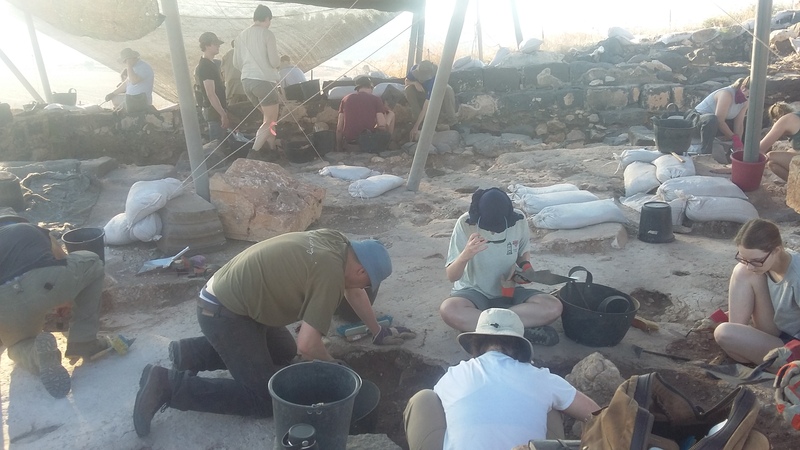 Students at work during the excavations. Photo by Raimo Hakola. During this year’s campaign, carried out in June and July 2018, the team focused on excavations below the floor level of the broadhouse synagogue. The team was able to expose, among other things, a terrace wall running from north to south. Our initial interpretation is that this wall served as a foundation wall for the eastern wall of the mosaic synagogue. The preliminary analysis of the pottery suggests that the wall was constructed in 350-400 CE, which corroborates with the dating of the so-called “mosaic synagogue” based on a coin found in the bedding of the mosaic. The team now has enough evidence to postulate that the synagogue with the mosaic floor was built in the second half of the fourth century. After the destruction of this building in the early fourth century, a new and larger broadhouse synagogue was built on the site of the earlier building and this new building remained in use for over 200 years. Excavations beneath the floor of the later synagogue. Photo by Raimo Hakola. Raimo Hakola, one of the co-directors of the Horvat Kur excavations, led the Helsinki excavation team in 2018. Helena Wahala took care of find registration and prof. Ismo Dunderberg and theology student Yoon-Hee Choi participated in the excavations as volunteers. 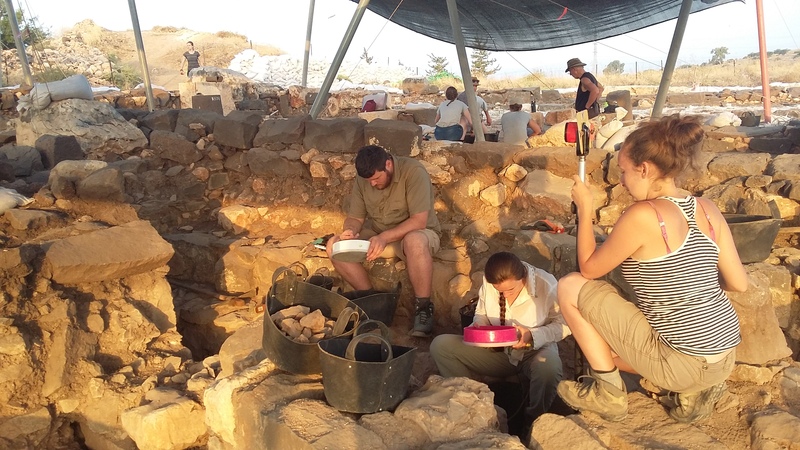 The Kinneret Regional Project now focuses on the analysis of the finds and findings and continues the preparation of the final excavation report. Raimo Hakola, Rick Bonnie and Ulla Tervahauta will contribute to the forthcoming publication. 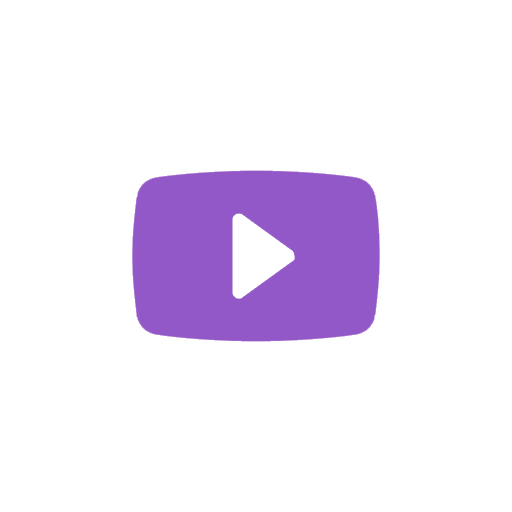 The Horvat Kur excavations are a part of the research program of CSTT. These excavations clarify the changes that took place in Jewish society after the destruction of the Jerusalem temple in 70 CE when synagogues became important local centers and assumed some of the roles that the temple earlier had. CSTT has been an important sponsor of the excavations that have been carried out in co-operation with the Finnish Institute in the Middle East.